Why should we be concerned about quagga/zebra mussels in Idaho? They reproduce quickly and in large numbers. Once established, eradication is extremely difficult though new technologies are becoming available. Their establishment in Idaho waters could result in an environmental and economic disaster. The quagga will upset the food chain by consuming phytoplankton that other species need to survive. They are filter feeders that consume large portions of the microscopic plants and animals that form the base of the food web. Their consumption of significant amounts of phytoplankton from the water decreases zooplankton and can cause a shift in native species and a disruption of the ecological balance of entire bodies of water. In addition, they can displace native species, further upsetting the natural food web. Figure 2 on the left zebra mussels living on a crayfish. What is the economic impacts? Quagga/zebra mussels can colonize on hulls, engines and steering components of boats, other recreational equipment, and can damage boat motors and restrict cooling. They also attach to aquatic plants, and submerged sediment and surfaces such as piers, pilings, water intakes, and fish screens. In doing this they can clog water intake structures hampering the flow of water. They frequently settle in massive colonies that can block water intake and threaten municipal water supply, agricultural irrigation and power plant operations. U.S. Congressional researchers estimated that an infestation of the closely-related zebra mussel in the Great Lakes area cost the power industry $3.1 billion in the 1993-1999 period, with an economic impact to industries, businesses, and communities of more than $5 billion. Where are the mussels now? The USGS Nonindigenous Aquatic Species website provides a daily updated map of both quagga and zebra mussels. Click on the following link to view the latest. Are quagga mussels similar to zebra mussels? The quagga is a close relative of the zebra mussel and is very similar in appearance and in environmental and economic impact. Quagga mussels differ from zebra mussels in that they are heartier and can live at greater depths and in colder temperatures. Quagga mussels have actually displaced zebra mussel populations in some infested areas. Do quagga/zebra mussels have predators? Quagga/zebra mussels have few natural predators in North America. It has been documented that several species of fish and diving ducks have been known to eat them, but these species are not an effective control. In some cases, the musssels concentrate botulism toxin causing bird die offs. 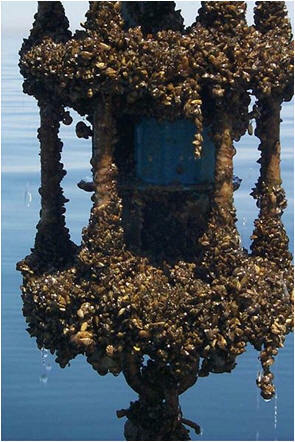 It may be possible to eradicate quagga/zebra mussels if they are in small masses and low density. However, preventing their spread is the best course of action.